It may be hard to believe but action legend Arnold Schwarzenegger has never been involved in a film with zombie aspects until now. Since the classic approach to the undead theme has become increasingly mundane over the years, it's doubtful that he will also battle them in the typical action manner in the future. With Maggie, he opted for a different way instead and that is certainly a rather untypical choice when looking at his other works. No explosions, no shootouts, no splatter orgies - thus none of the usual ingredients for this subgenre. And that fits the concept of Maggie quite well as it is a calm, almost minimalistic drama that's soaked in grey coloring and melancholic soundtrack. The story concentrates on an aspect of the zombie topic that the vast majority of genre colleagues deal with in a matter of minutes or even just a few seconds: the transformation of an infected human into a zombie. Here, the daughter Maggie is affected and she and her family have to come to terms with the inevitable fate that awaits. 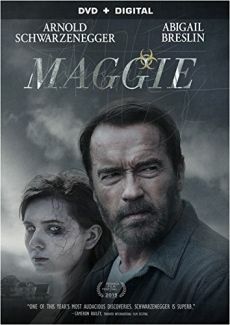 Schwarzenegger plays her father Wade who stands by her side until the end and has to show a different facette of his acting skills. Corny one-liners and handling weaponry are not at his arsenal here. It is certainly a bit unusual to see the veteran like this and action fans might not like it, being disappointed that there's not the action they might have hoped for when they noticed the project. However, it should be noted as a good sign that he tried something new and didn't fall back on the safe known territory that made him famous for so long. The film is rated PG-13 and that is fitting as it almos always avoids violent scenes when there would be the opportunity to be more graphic. Still, a runtime difference of more than 2 minutes between the US (and also Canadian) Blu-ray versus the German Blu-ray got us interested and we checked. Might there be an alternate version that's more in the "R" territory after all? The short answer is: nope. The German BD (possibly among others) has a small, additional plot scene. However, that is not really a downside for the releases that are missing it because contentwise it's really redundant as the message of the scene becomes clear enough at a later point in the film. Still, it is a difference and thus enough reason for this comparison. Compared are the German Blu-ray (FSK Keine Jugendfreigabe) (by Splendid Film) and the US Blu-ray (PG-13) (by Lionsgate Home Entertainment). 0:21:35: Wade goes from the bathroom to the bedroom where Caroline is dressing for bed. She hugs and kisses him and obviously tries to get his affection but he doesn't go for it. He says that his thoughts are with Maggie whenever he can. Caroline says that Maggie is well but Wade guilts her because he had to send away their two healthy kids because Caroline felt that Maggie was too much of a risk. Caroline is hurt by that and tells him that she didn't mean it that way but that she feels so shut out by her. Wade leaves the room and sits down in a chair where he looks at a picture on his phone that shows Maggie with her real mother. This subplot comes on board in the film once more later so this scene is more of an unnecessary repetition.